As you may recall, I recently wrote on Omega Healthcare Investors (OHI) and Medical Properties Trust (MPW). While these two healthcare REITs are completely different in terms of their underlying real estate, they share the same operator profile. You see, both of these REITs generate revenue from the government, via Medicare and Medicaid, and this exposes their operators to higher risk. In addition, skilled nursing properties and acute care hospitals are generally located in secondary markets where cap rates are much higher (than medical office, life science, or senior housing properties). This makes the business models for these two REITs higher risk and of course that’s why the dividend yields are higher. 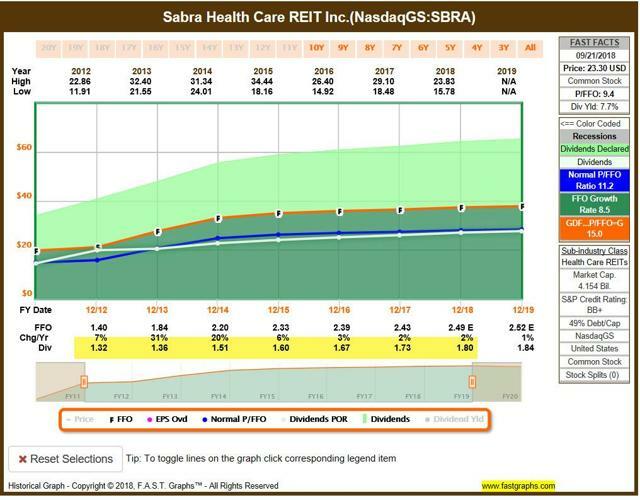 In order to close the circle, I thought it would be appropriate to take a closer look at Sabra Health Care REIT (SBRA). Like OHI and MPW, SBRA invests in the higher-yielding properties that, in turn, generate higher dividends. We recently upgraded MPW from a HOLD to a BUY and we are maintaining a BUY on OHI (after a 25% run-up YTD). 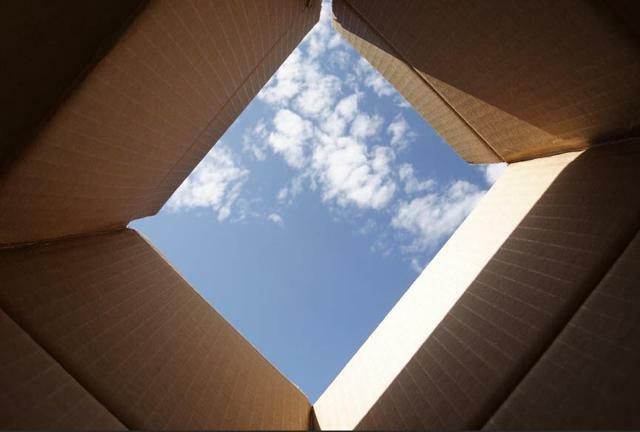 At the end of this article, I will provide you with our updated SBRA recommendation, and for now, let’s determine what SBRA’s CIO means when he says, “we are not afraid to step outside the proverbial box”. You may recall, I upgraded shares in SBRA from a HOLD to a BUY in January, and that has proven to be a well-timed recommendation. First off, remember that in August 2017, SBRA completed the merger with Care Capital Properties (formerly CCP) in a 100% all-stock combination. When CCP merged with SBRA, the company planned to reduce its concentration to Genesis (GEN) – from 33% of NOI to 11% – and Holiday – from 16% to 6%. 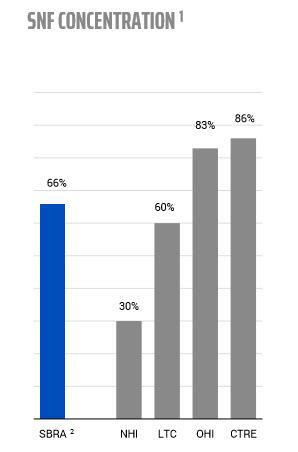 As of Q2-18, SBRA had around 8% exposure to GEN and 6% exposure with Signature Health. 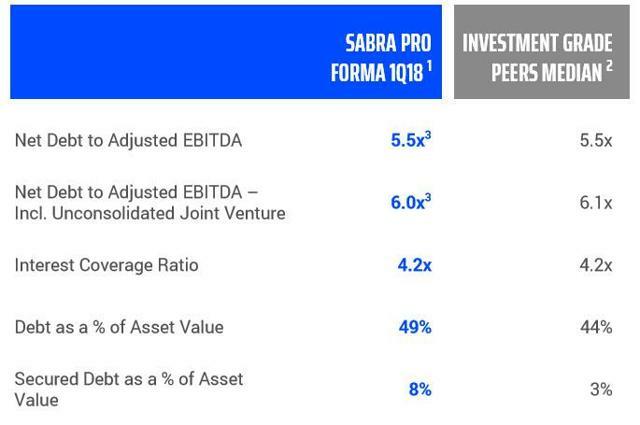 However, in a recent investor deck, SBRA revealed it will have 3.6% exposure (based on rent) after selling 19 facilities (that generate $10.0 million in rent). Also, the Signature Health restructuring is going well; SBRA revealed it provided a term loan of up to $12M at a 7% interest rate for a period of 7 years to provide Signature with working capital. Also, SBRA combined existing master leases (with Signature) into a single master lease with an 11-year term commencing on May 7, 2018 with three 5-year extension options. The cash rent of $35M (net of estimated $15M annual rent deferral) is anticipated to result in normalized EBITDAR coverage of 1.30x. 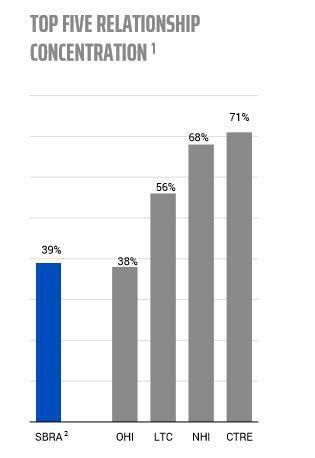 Annual CPI-based rent escalators between 2.50% and 3.50%. Also, SBRA has targeted dispositions of up to four non-core Signature assets, resulting in an estimated rent credit of $1.9M based on projected proceeds of $22M. 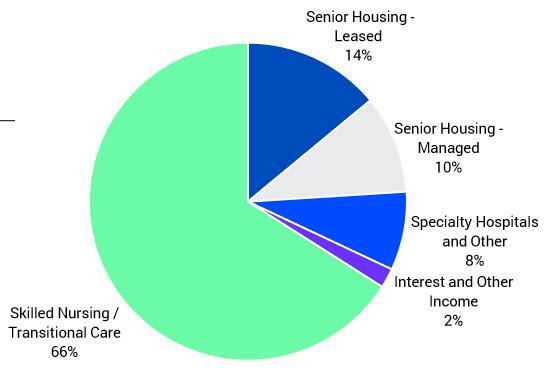 Keep in mind that SBRA is not so much of a “pure play” skilled nursing REIT like OHI, the company has 66% exposure (to skilled nursing) vs. 83% skilled nursing exposure for OHI and 86% exposure for CareTrust (CTRE). Here’s a snapshot of SBRA’s portfolio. 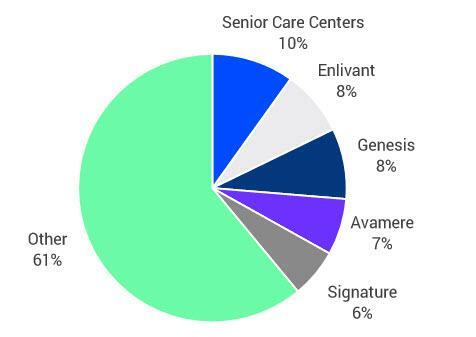 As you can see, the company has 24% invested in senior housing, 8% invested in specialty hospitals, and 2% in other. 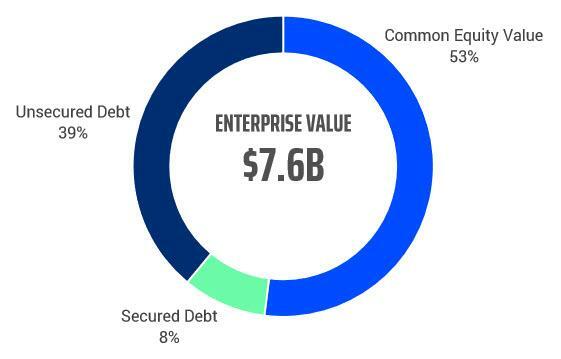 SBRA is in compliance with all of its debt covenants and continues to maintain a strong balance sheet with the following pro forma credit metrics: Net debt to adjusted EBITDA of 5.53x, net debt to adjusted EBITDA (including unconsolidated joint ventures debt) of 5.99x, interest coverage of 4.14x, fixed charge coverage of 3.88x, total debt to asset value 50%, secured debt to asset value 8%, and unencumbered asset value to unsecured debt of 216%. On June 1, SBRA redeemed all 5.75 million shares of its Series A Preferred stock price at a redemption price of $25 per share plus accrued in unpaid dividends for an aggregate payment of $146.3 million. As a result of redemption, the company incurred a charge of $5.5 million coming to the write-off of the original issuance costs of the Series A Preferred stock. As a result of the CCP merger, SBRA’s diversified tenant base and scale positioned the company to achieve investment grade credit ratings. SBRA now sports an investment-grade rating from Fitch after the agency boosted to BBB- from BB+. On August 8th, SBRA announced that its Board of Directors declared a quarterly cash dividend of $0.45 per share of common stock. In Q2-18, SBRA reported revenues and NOI of $166.3 million and $162.7 million, respectively, compared to $64.7 million and $60.3 million. These increases are due predominately to revenues and NOI generated from the properties acquired in the CCP Merger and the Enlivant transactions. SBRA’s FFO for the quarter was $104.5 million, and on a normalized basis was $109.7 million, or $0.61 per share. 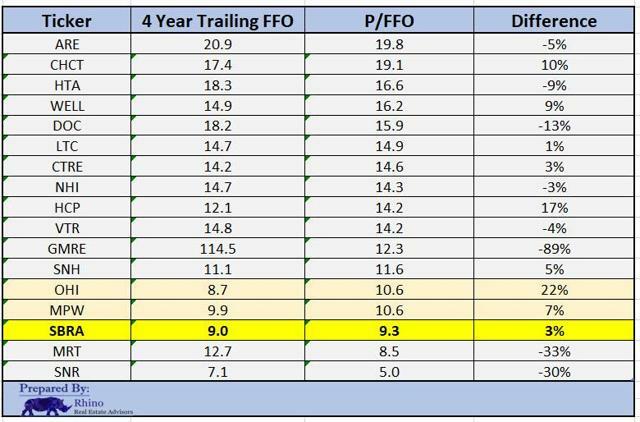 AFFO, which excludes from FFO merger and acquisition costs and certain non-cash revenues and expenses, was $98 million, and on a normalized basis attributes including similar items as normalized FFO was $102.8 million or $0.57 per share. 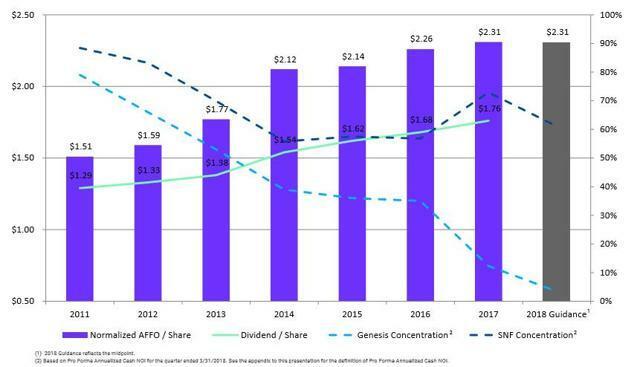 This compares to normalized AFFO of $35.2 million, or $0.53 per share in Q2-17, a per share increase of 7.5%. SBRA has been one of the most active net acquirers in the healthcare REIT sector in 2017-18, and Kim “believes [SBRA] is poised to grow externally in 2019, ahead of some of its peers”. KIM estimates SBRA’s FFO per share growth will accelerate moderately to 3.2% CAGR in 2018-20, from 2.5% from 2015-18. However, he estimates “SBRA has recently disposed of assets at a 24% cash loss, thus acquisitions may be scrutinized”. As you can see, SBRA is trading at 9.3x, lower than MPW (10.6x) and OHI (10.6x). Also, SBRA is trading at 3% above the company’s trailing 4-year P/FFO average. 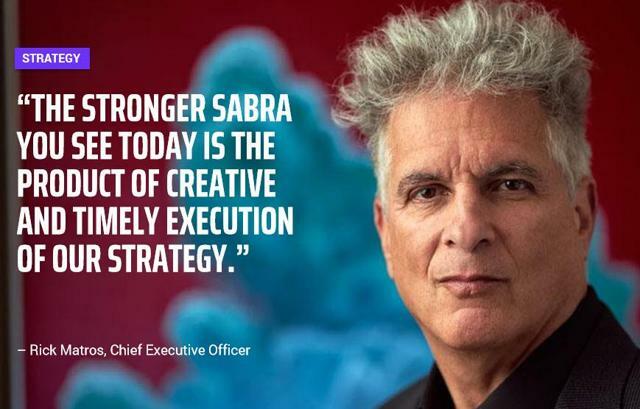 In conclusion: We are maintaining a BUY on SABRA as we consider the price performance to be an indicator that the management team is executing on its promise – “the product of creative and timely execution of strategy”. 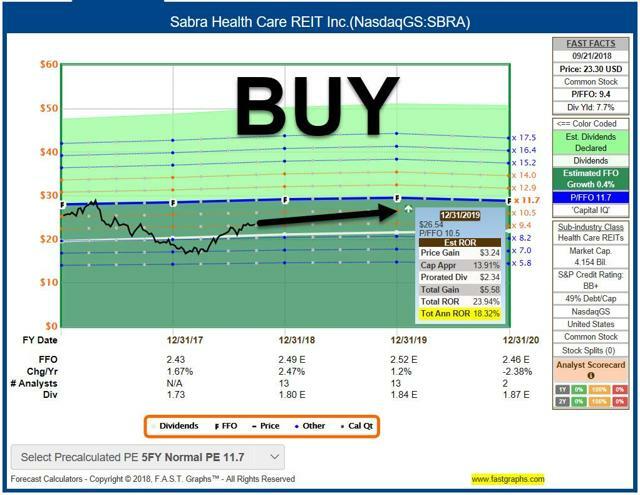 Sometimes investors must also “step outside the box” and we are happy that we did so with Sabra Health Care REIT. Sources: FAST Graphs and SBRA Investor Presentation. Brad Thomas is one of the most read authors on Seeking Alpha (based on page-views), and over the years, he has developed a trusted brand in the REIT sector. His articles generate significant traffic (around 500,000 views monthly) and he has thousands of satisfied customers who rely on his expertise. Marketplace subscribers have access to a growing list of services, including weekly property sector updates and weekly Buy/Strong Buy/Hold/Sell (and soon Strong Sell) recommendations. Also, we are now providing daily early morning REIT recaps including breaking news across the entire REIT universe. For new subscribers we will include a FREE autographed copy of The Intelligent REIT Investor. Act Now! Disclosure: I am/we are long ACC, AVB, BHR, BPY, BRX, BXMT, CCI, CIO, CLDT, CONE, CORR, CTRE, CXP, CUBE, DEA, DLR, DOC, EPR, EQIX, ESS, EXR, FRT, GDS, GEO, GMRE, GPT, HASI, HT, HTA, INN, IRET, IRM, JCAP, KIM, KREF, KRG, LADR, LAND, LMRK, LTC, MNR, MPW, NNN, NXRT, O, OFC, OHI, OUT, PEB, PEI, PK, PSB, PTTTS, QTS, REG, RHP, RLJ, ROIC, SBRA, SKT, SPG, SRC, STAG, STOR, TCO, TRTX, UBA, UMH, UNIT, VER, VICI, VNO, VNQ, VTR, WPC.